Following the approval of the first chimeric antigen receptor (CAR-T) cell construct by the FDA on August 30, 2017, industry stakeholders have been grappling with the many challenges of commercial-scale manufacturing of these types of therapies. Historically, the manufacturing processes utilized at the clinical scale (i.e., for clinical trials) for CAR-T-based investigational new drugs (INDs) employed first-generation manufacturing protocols and legacy equipment that lacked commercial applicability. CAR-T cell companies and contract development and manufacturing organization (CDMOs) alike recognize the need to employ manufacturing protocols that will be able to be scaled as early as possible in a product development life cycle in order to be able to meet anticipated commercial demand. Processes to make autologous products must be scaled out to meet demand without sacrificing product quality and/or process robustness. Manufacturers must also be able to ensure that the manufacturing related cost of goods sold (COGs) are not prohibitive in terms of the product’s overall commercial viability. In contrast to unidirectional manufacturing schemas, such as the manufacturing process used by pharma for KTE-C19, conditional manufacturing pathways in which the starting materials dictate direction of said pathways have emerged as a solution to the variability in the autologous starting materials. While conditional pathways allow for flexibility in the manufacturing process, process comparability and reproducibility must also be demonstrated and maintained. Automation is regarded as a means to maintain process reproducibility for conditional manufacturing pathways. Other drivers for the growing trend in process automation for CAR-T manufacturing include reduced COGs, increased product consistency, increased operational efficiency, decreased operator variability, and the ability to validate. Equipment plays a large role in CAR-T manufacturing and manufacturing automation. A unit operations-based approach to automation may be employed whereby individual steps of the manufacturing process are automated; conversely, the integrated approach to manufacturing streamlines many different steps of the manufacturing process into a single, automated platform. 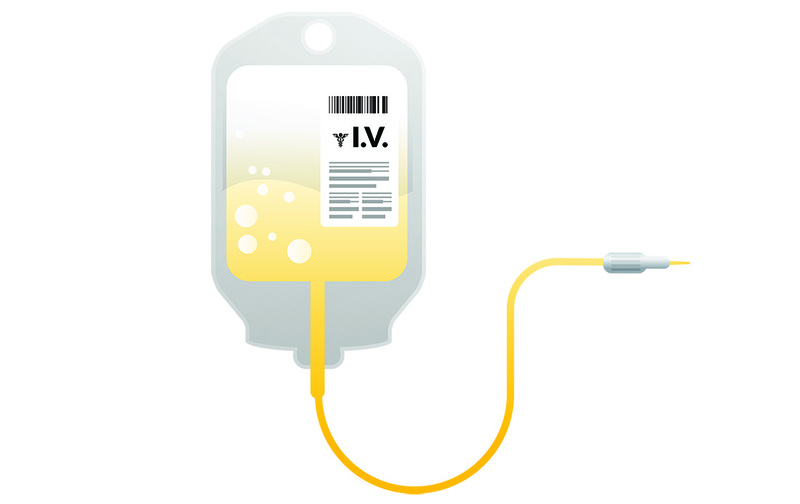 While an integrated, closed-manufacturing approach increases safety while lessening the facility requirements (and potentially the lot-release testing requirements), equipment usage may not be optimal for manufacturing processes for autologous products with long vein-to-vein time periods. In such instances, it may be optimal (from a production and operational efficiency standpoint) to automate the unit operations that are the most labor-intensive. Stakeholders are tasked with developing and automating manufacturing protocols based on the attributes of their individual constructs and starting materials, which may be disease group- and subtype-specific, as well as the parameters of their process(es), all within the framework of the chosen manufacturing model (for examples of models, see Table 1). One of the major equipment manufacturers and stakeholders in the unit operations space is GE Healthcare Life Sciences. The CAR-T cell manufacturing unit operations approach used by the company involves the Sepax™ Automated Cell Processing System (apheresis product processing), the Xuri™ bioreactor (expansion), and the Biosafe Sefia (concentration and wash). GE’s Asymptote acquisition in April 2017 resulted in the addition of a cryochain platform that incorporates Good Manufacturing Practice (GMP)-compatible thawing instruments as well as controlled-rate freezing devices. Similarly, Cesca Therapeutics recently announced that USPTO granted it a patent for a cell-separation technology that will be a key component of its proprietary CAR-T cell manufacturing unit operations platform. Other stakeholders, such as Octane, have opted for a more integrated approach to manufacturing (e.g., Cocoon™) that may be better suited to handle the thousands of daily interactions that will be required for the commercial-scale production of autologous CAR-T cell therapies. Regardless of the manufacturing protocol approach selected, additional regulatory considerations, guidelines, standards, and guidance documents apply as protocols move toward increased automation, (i.e., current Good Automated Manufacturing Practice [cGAMP], ASTM E2500, ISO 14791, 21 Code of Federal Regulation [CFR] § 211.68 and 21 CFR § 1271.160[d]). Table 1. 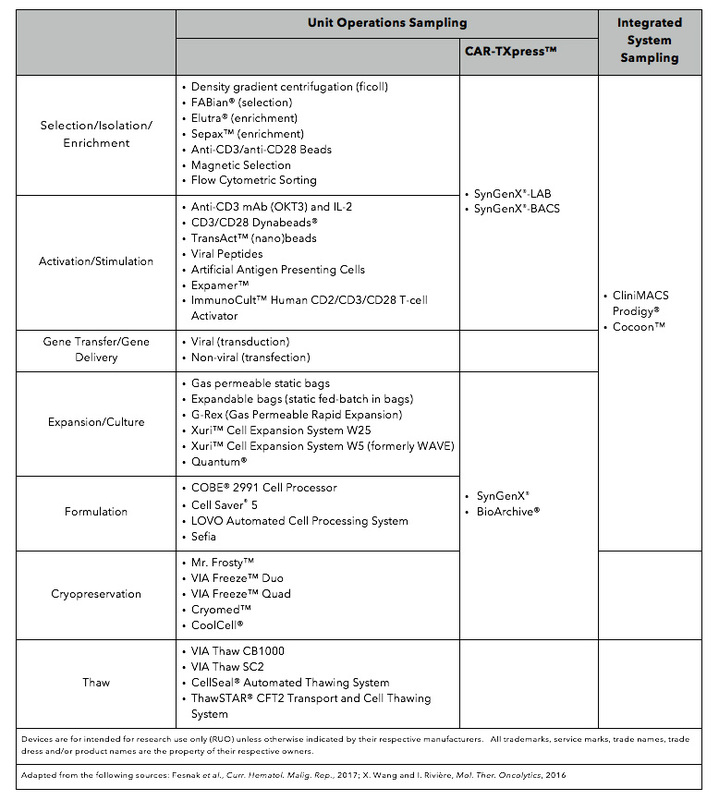 Listed are technologies used to manufacture CAR-T cells. 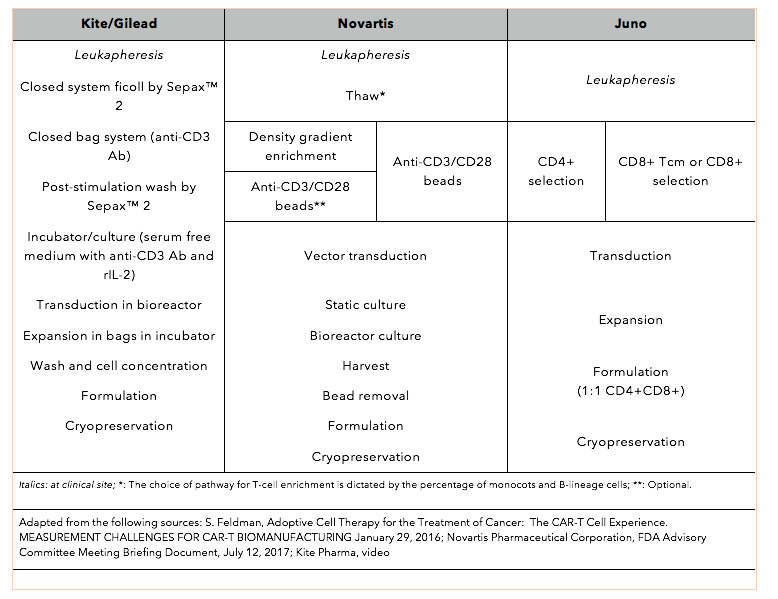 The variability in manufacturing options for autologous CAR-T cells targeting CD19 is easily demonstrated by the overview of the manufacturing protocols used by three of the major CAR-T stakeholders: Kite Pharma (recently acquired by Gilead); Novartis SA, the first company to gain marketing approval in the United States for a CD19 CAR-T cell therapy; and Juno Therapeutics (Table 2). 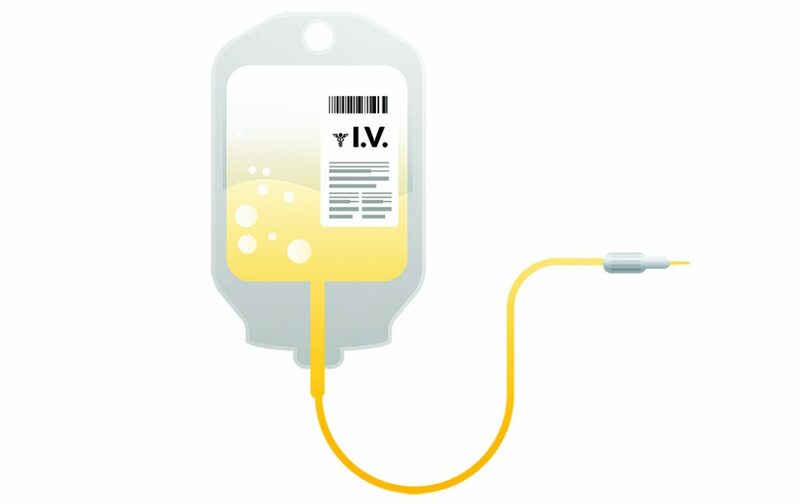 Conditional manufacturing pathways allow Novartis to deal with the inherent variability in the source-derived starting material, as the percentage of monocytes and B-lineage cells in the leukapheresis product dictates the choice of manufacturing pathway. The Novartis CAR-T cell-manufacturing process includes the following equipment: the Dynabeads® CD3/CD28 Cell Therapy Systems (Thermo Fisher Scientific); Elutra (Terumo BCT); Cell Saver® 5 (Haemonetics); and the Sepax™ Automated Cell Processing System (Biosafe). The El Segundo, California-based commercial manufacturing facility of Kite Pharma includes $4 million dollars worth of Sepax™ Automated Cell Processing Systems. Moreover, Kite and GE are currently developing a next-generation, automated manufacturing system. The integrated cell-handling system that is being developed by Juno Therapeutics includes Juno’s following proprietary production technologies: T-CATCH™; Streptamer™ technology; and Expamer™ technology. Table 2. An overview of the manufacturing protocols used by three of the major CAR-T stakeholders: Kite Pharma, Novartis SA, and Juno Therapeutics. New platforms are already under development for autologous processes. For example, in addition to developing the aforementioned novel manufacturing platform for Kite Pharma, GE Life Sciences is developing custom manufacturing solutions for the Cellular Biomedicine Group that operates out of China whereas GlaxoSmithKline is said to be developing a next-generation manufacturing platform for its undisclosed CAR-T cell constructs with Miltenyi Biotec. Additionally, a group at the University of Pennsylvania is developing a technology for the automated, microfluidic manufacturing of antigen-specific T cells for adoptive cellular therapy via the Medical Device Accelerator program; the device being developed as part of the program is focused on T-cell isolation, activation, and transduction. Next-generation platforms are likely to shift toward sequential activities where production and lot-release testing are done in parallel (i.e., products are tested throughout the manufacturing process itself). Technological developments and advances to enable further CAR-T cell-commercialization efforts extend beyond the CAR-T cell-manufacturing process itself. The automation of data handling is arguably as important as the automation of the manufacturing process for autologous therapies in which each manufactured product has its own batch record. Industry, however, has not yet come to a consensus with regard to the amount and type of data that need to be collected and retained; some in the field are advocating for the collection of necessary data only, whereas others are advocating for the collection and retention of as much data as possible throughout the manufacturing process. Process analytical technology (PAT) for autologous products, batch records, and quality assurance (QA) are other areas that will likely benefit from advancements in technology, integration, and automation moving forward. With regard to the manufacturing model, the integration of multiple devices and multiple manufacturing sites via electronic systems could enable a shift toward decentralized manufacturing in the future. The next-generation platforms and instruments that enable autologous product manufacturing—those which do not sacrifice product purity—will hopefully drive down the commercial manufacturing-related COGs much in the same way that technical advances have driven down the cost of manufacturing clinical-grade CAR-T cell INDs tested in clinical trials. Although we have just seen the first approval of a CAR-T cell product by the U.S. FDA, it remains to be seen how product reimbursement will play out on the national and/or international stage. Ultimately, the commercial viability of CAR-T cell products will depend on the ability of companies to manufacture products quickly, consistently, and safely via reproducible, validated protocols. The key is to do this at a price point that does not exceed what the payers are willing to reimburse following marketing authorization. All trademarks, service marks, trade names, trade dress, and/or product names are the property of their respective owners.